Home » Directories » HVACR Directory » Consolidated Refrigerant Solutions Inc. Complete cylinder management reclaim program delivers the industry's most comprehensive and profitable reclaim services. Onsite exchanges, high quality standards for field use recovery cylinders, effortless compliance through state-of-the-art Reclaim Data Management. Description: Further pursuing our mission of simplifying the reclaim process for mechanical contractors, Consolidated Refrigerant Solutions has now made it even easier for our reclaim partners to manage and exchange their refrigerant recovery cylinders. 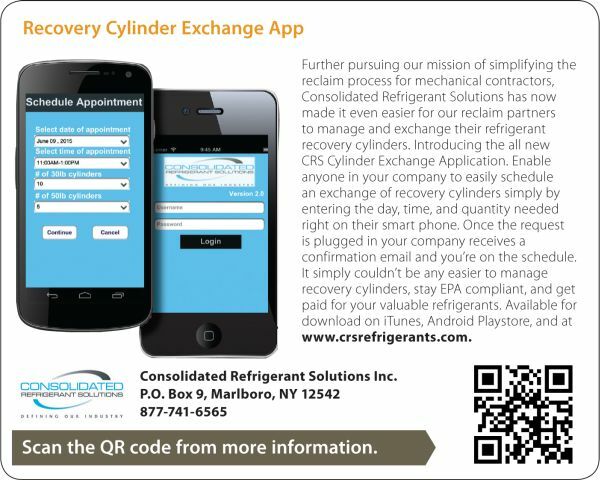 Introducing the all new CRS Cylinder Exchange Application. Enable anyone in your company to easily schedule an exchange of recovery cylinders simply by entering the day, time, and quantity needed right on their smart phone. Once the request is plugged in your company receives a confirmation email and you’re on the schedule. It simply couldn’t be any easier to manage recovery cylinders, stay EPA compliant, and get paid for your valuable refrigerants. Available for download on iTunes, Android Playstore, and at www.crsrefrigerants.com.